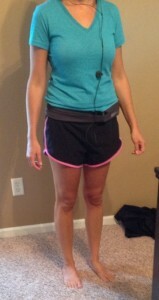 Disclosure: The FlipBelt was provided for me in order to facilitate my review. All opinions are my own and honest. I am disclosing this in accordance to FTC Guidelines. Please see “Disclose” tab for more information. I am always on the go. A lot of the time my girls are with me, but there are times that I get to go out for a run or walk by myself. I must admit that I typically take my phone with me everywhere but really hate holding onto it and my house key while I’m out and about. FlipBelt is the perfect solution for this problem. Everyone has something that they need to carry, but not always the hand to hold it. FlipBelt is the solution for this problem. FlipBelt is designed to carry your on-the-go essentials without tying up your hands. It is made of moisture-wicking, spandex-lycra blend, FlipBelt slides right on and sits snug on your hip. There is no bulk or no bounce. FlipBelt is also machine washable and machine dryable. I have been completely impressed with my FlipBelt. It works wonderfully. I have put my cell phone in it as I am out and about to use it as I run. I love that I can have it with me, but it isn’t a pain to hold onto. I also have put house keys in it. A few times I have even put a waterbottle in it and it fit great. There were no problems with it riding down or up even with the extra added weight. It never even seems to get hot and heavy no matter how long I’m out and about. I love it and I like to say that it’s truly like the “new fanny pack” 🙂 It works great at holding everything you need and it’s completely handsfree. If you are interested in purchasing this awesome product, head on over to FlipBelt and get one ordered for yourself! Thanks for the giveaway! I am excited. I hope I win the prize. 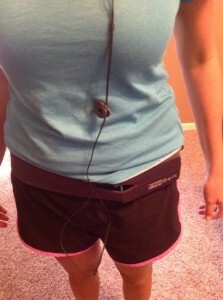 I learned that FlipBelt is designed to carry your on-the-go essentials without tying up your hands. FlipBelt is designed to carry your on-the-go essentials without tying up your hands. Made of a moisture-wicking, spandex-lycra blend, FlipBelt slides right on and sits snug on your hip. Sounds like just what I need! I like that it stays snug around any waistline. this is a very useful item not just for excersising but for other quick travels as well. Thanks for the giveaway! I am excited. I hope I win the prize! It comes in multiple colors. I learned that FlipBelt is also machine washable and machine dryable. Thanks for the great giveaway! The belts are available in lots of different colors to match what is being worn. I learned that it is lightweight and won’t bunch or ride up. It also has multiple openings so you can store a bunch of things. I learned that FlipBelt is designed to carry your on-the-go essentials without tying up your hands. Made of a moisture-wicking, spandex-lycra blend, FlipBelt slides right on and sits snug on your hip. No bulk. No bounce. FlipBelt is also machine washable and machine dryable. “Thanks for the giveaway! I am excited. I hope I win the prize. I do NOT run! LOL Oh no, no running for me. BUT I do walk. And I walk a lot. and I go deeeeep into the woods. No one really knows where I go. I’ve thought about this, oh yes, I have.. what if? What if a moose or bear gets me while I’m out here?? Who would know where to start looking? LOL I think I ought to bring my phone with me. I could use this belt for that!!! Thanks for the giveaway! I am excited. I hope I win the prize.! This looks useful! Fingers crossed. I learned The FlipBelt is not waterproof. It is a quick dry, wicking fabric so a mild amount of sweat will bead off of the belt. If you wear your FlipBelt where it is in contact with your skin, depending on the amount of sweat, it may soak through. Waterproof material requires fabric treatment that will cause the belt to not be breathable, which can cause discomfort if worn against the skin. It is always recommended that people put their electronics into a zip lock bag before placing them into the belt if they are going to be doing vigorous activities. We offer complimentary slip cover for electronics, which are re-sealable plastic bags that are fitted for most smart phones. Thanks for the giveaway! I am excited. I hope I win the prize.. I could use this for when I am exercising. I learned the FlipBelt can be purchased at various retail outlets, including Brazos Running Company, which is the closest to me. Thanks for the chance!